Water is a naturally healthy beverage that hydrates you and delivers minerals such as potassium, calcium and magnesium. It does not, however, contain vitamins. Luckily there are other beverages that do offer health benefits, including vitamins and a bit more taste. 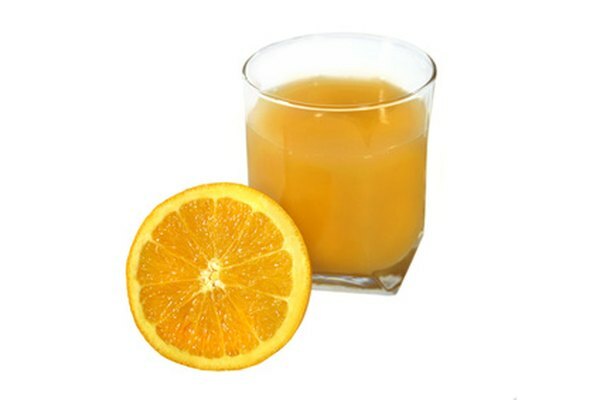 Orange juice can be a healthy beverage. It's rich in vitamin C, a powerful booster for your immune system, and it contains hesperidin, a natural chemical found in plants. Hesperidin may decrease blood pressure, a condition that can lead to heart disease. “The American Journal of Clinical Nutrition” provided results of a study in 2010 that suggested that orange juice can help lower blood pressure due to its hesperidin content. Herbal tea can offer benefits, especially green tea. The leaves used in green tea are rich in polyphenols -- antioxidants that fight against harmful components called free radicals. Free radicals are compounds in your body that damage cells, and can cause health problems and even death. By drinking green tea, you're consuming these antioxidants naturally. The University of Maryland Medical Center explains that certain Eastern cultures use green tea for a number of reasons, including as an astringent to promote wound healing and as a diuretic. Green tea regulates blood sugar, may help with gas problems and possibly lower total cholesterol. It may also help increase your “good” HDL -- high-density lipoprotein -- cholesterol. The National Cancer Institute states that “tea polyphenols have also been shown to inhibit tumor cell proliferation,” although the studies have focused on laboratory animals. Milk in general is healthy, especially low-fat milk. Low-fat milk provides the same health benefits of whole milk, without all the fat. It's a rich source of vitamin D and calcium, and both are supporters of teeth and bone health. The protein content of milk is high, a plus for your muscles. It also contains a generous amount of both potassium and magnesium that may help lower blood pressure. For those who cannot drink cow's milk, soy milk is a safe and healthy alternative. It's naturally rich in essential vitamins including vitamin A, some B complex vitamins, as well as D and E. It also contains no cholesterol. Soy milk provides iron, zinc and antioxidants to fight aging, and even the omega-3 fatty acids that you need to live. Some benefits of soy milk include lowering cholesterol, helping with arthritis, and decreasing your chances of coronary heart disease. MayoClinic.com reports that dietary soy can reduce the chances of breast cancer in women and prostate cancer in men.